I’ve always liked to climb up to the heights, whether by foot, automobile or elevator. Fortunately the parts of New Zealand and Australia we visited included many such opportunities. Some were man-made while others appeared as natural features of the magnificent terrain. Most days brought plenty of chances to appreciate the scenery in all kinds of different weather conditions. Sometimes we lucked out and got blue skies and sunshine, other times we battled rain or fog, often within a few minutes of each other. I’m getting ahead of myself though so let me slow down and let the story unfold. Anyone looking at the Auckland, New Zealand skyline would see the needle-like Sky Tower rising 328 metres (1,076 feet) to its peak. The tower rose only a couple of blocks away from where we rented our apartment and we walked past it probably a dozen times (map). Eventually we found a little time in our schedule to step inside. 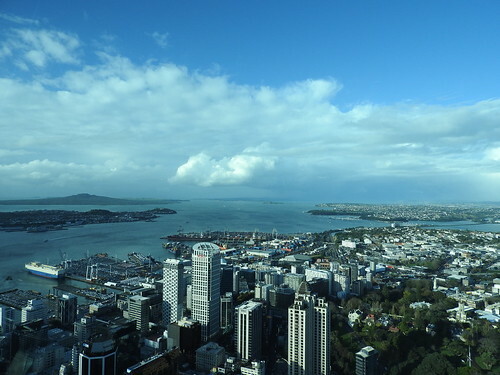 We rode the high speed elevator to the uppermost observation level for an unobstructed 360° perch above Auckland, which is where I took this photograph. The floor included a small sheet of clear acrylic glass with a view straight down to the street directly below. Of course my younger son the daredevil stood directly atop it. Supposedly it had the strength of concrete, as safe as any other part of the floor. Nobody else wanted to take their chances. The view was pretty amazing too. We took the ferry across Auckland Harbor to Devonport and toured the seaside village, as described in a previous article. We walked along the edge of Torpedo Bay for about twenty minutes until we reached the North Head Historic Reserve. This promontory had several features that matched my interests. It offered nearly unrivaled views of Auckland, for one. It also figured into New Zealand’s history in some small way from the late Nineteenth Century until the middle of the Twentieth. Britain and Russia nearly came to blows in 1885 during the so-called Panjdeh incident. Russian expansion in central Asia triggered British ire when Russia seized an outpost along the Afghan border. Britain feared that eventually Russians would move towards India. Diplomacy diffused the dispute and averted a potential war. However, that still convinced Britain to fortify Auckland Harbour and the commanding heights of North Head seemed a logical choice. A network of bunkers, tunnels and guns remained in place until decommissioned soon after the second World War. Their remnants sill existed on North Head and walking trails led through them. This also marked the only "weather disaster" of our trip. We hiked nearly to the top of the hill and the skies opened up with a driving rain, a fierce wind and even a bit of hail. 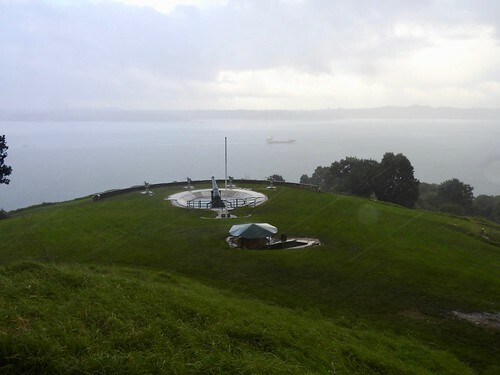 I took only one photo from North Head before we ran back down the hill and took refuge in the New Zealand Navy Museum. Those who look closely can see the rainfall coming down hard in the photograph. We were completely soaked — umbrellas offered no help — and we never got to see the bunkers or the tunnels, and saw only that one gun. I already introduced 12MC readers to Mount Eden in Auckland Origins so I don’t need to repeat myself. I did need to select a different photo though. 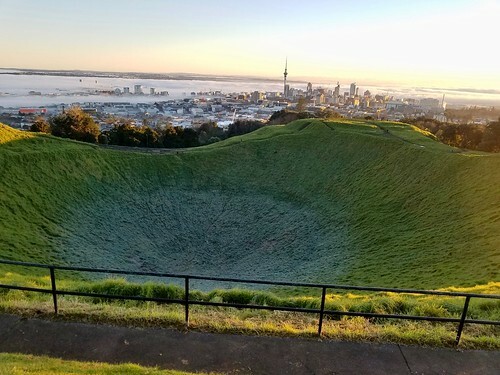 This time I wanted to feature the mound’s volcanic crater, with Auckland’s city centre in the background. Of course the Sky Tower appeared in the distance. Fog filled every crevice at lower elevations. In the foreground, frost lined Eden’s bowl on this crisp winter morning. We actually visited Auckland twice, the bookends of our week in New Zealand. The second time we stayed in the suburbs to be near an event I’ll talk about in a later episode. As the only early riser in a family full of night owls, I usually had the mornings to myself. That meant I could run or take long walks and be back home before anyone else woke up. I’d seen Mt. Eden on a map and I calculated I could walk there in about 35 minutes. I wanted the exercise so I didn’t bother to bring my good camera along when I opened our door and saw nothing but an impenetrable fog. Everything disappeared beyond a few metres, barely clear enough to move along the sidewalk without getting lost. I came to the summit trail, climbed a little higher, popped through the fog and entered a world of beauty and light. The photos I took using my mobile phone hardly did it justice although it taught me a lesson about making judgments about the weather. Always bring the good camera. Apparently some higher being wanted to toy with me. 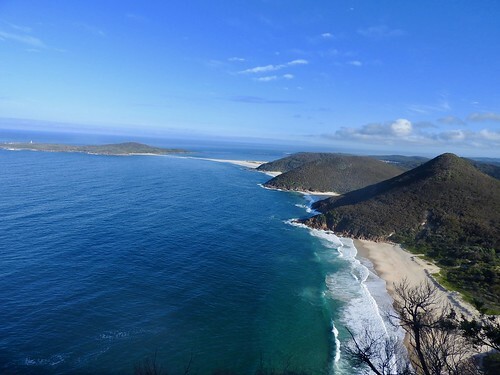 I experienced the exact opposite conditions on Gan Gan Hill in Port Stephens, Australia. We were staying in Nelson Bay, a couple of kilometres away. Once again I took my early morning solo walk, this time on an overcast day with visibility at ground level. I started walking up the paved access road to Gan Gan Hill and felt pretty good. 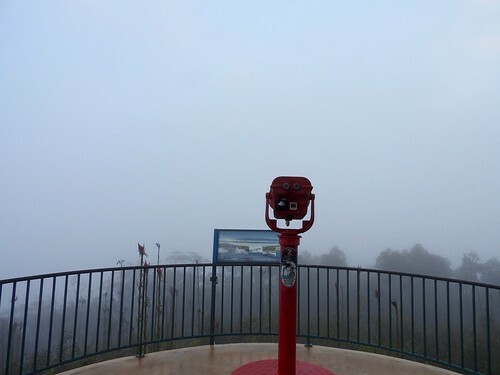 However, the clouds hung low and I encountered fog about three quarters of the way up the 160 metre (525 ft) summit. Obviously the views did not impress, although I had my good camera! I did remind myself of the true purpose. Fresh air and exercise. I always try to get outside and stretch my legs on every trip, usually without the benefit of "scenery" as a motivator. Nonetheless the lack of success nagged at me. Conditions improved later in the day so I popped up to Gan Gan as we drove past on the way back from another excursion. This time the whole family got to experience the view, a much improved version of what I’d experienced earlier in the morning if still a little cloudy. 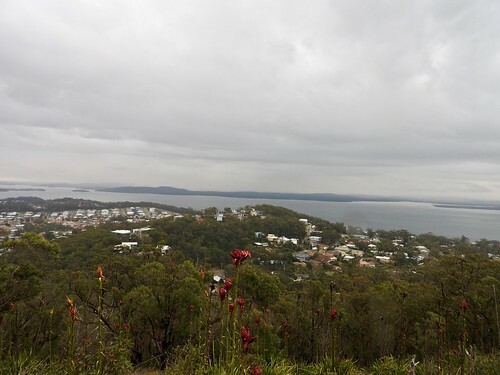 When you reach the summit, enjoy panoramic views of Yacaaba Head, Cabbage Tree, Boondelbah and Broughton Islands from the north platform. From the south platform, views of Zenith, Wreck and Box Beaches, Fingal Island and Point Stephens Lighthouse will be sure to impress. The summit trail also included a spur that lead to the other side of the mountain. There we explored concrete bunkers where artillery batteries protected the harbour entrance during World War II, the site of the former Fort Tomaree. Then we headed back downhill to our car. 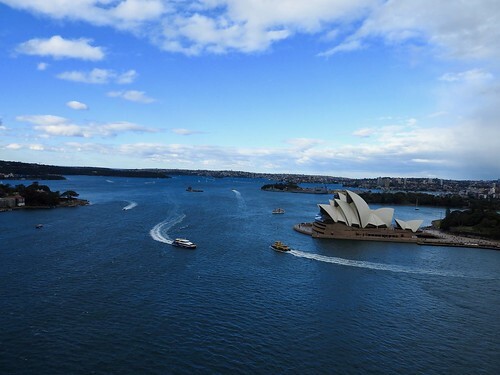 People could climb to the very top of Sydney, Australia’s iconic Harbour Bridge. Tours operated throughout the day even in less than desirable weather. Yes, people could do that in a theoretical sense, just not us. We made every excuse: too expensive; windy; time consuming; scary, whatever. My younger son seemed interested although I couldn’t convince anyone else. Instead we opted for a less extreme alternative, the Sydney Harbour Bridge Pylon Lookout atop the southeastern pylon. This still offered a pretty high altitude perch about 87 m (285 ft) above the water (map). However it didn’t require special equipment, liability waivers, or $300 per climber. Plus the pylon included a small museum that displayed the history of the bridge and described its construction. Maybe I’ll take the more adventurous climb next time.